Toward the end of the nineteenth century, political developments that opened new channels of communication between places formerly as distant as England and Japan confronted musicians with an impediment to transnational musical exchange: the presence of irreconcilable differences between tuning traditions. How to account for these differences? Music theory, musicology, and comparative musicology emerged as epistemological tools for quantifying the measurements of global tuning systems, aimed at explaining the scientific and sociological conditions that led to musical disparities. But for reformists who believed music was a powerful tool for social unification and intercultural collaboration, differences in tuning needed more than mere accounting. They called for a resolution — indeed a “revolution” — through a universal conversion to “just intonation,” a form of musical tuning that could constitute a kind of musical Esperanto capable of answering the social and political challenges posed by an increasingly interconnected world. The utopian’s faith in idealism, the liberal’s trust in the ameliorative potential of technology, and the colonialist’s conviction that “advanced” nations ought to promote the global development of “civilization” soon intersected in a “great cause” that aimed to restructure the material of musical sound in order to restructure society. My ongoing project, “Building a Just Society: Enharmonic Instruments, Transnational Politics, and Musical Discipline in 19th-Century Europe and Asia,” examines the global history of just intonation. I explore how theorists across Europe, Asia, and the Americas advocated forcefully for just intonation on the basis of scientific experiments that identified it as the tuning most naturally pleasing to aural physiology, and phylogenetic studies that suggested it was the common ancestor of all musical traditions. 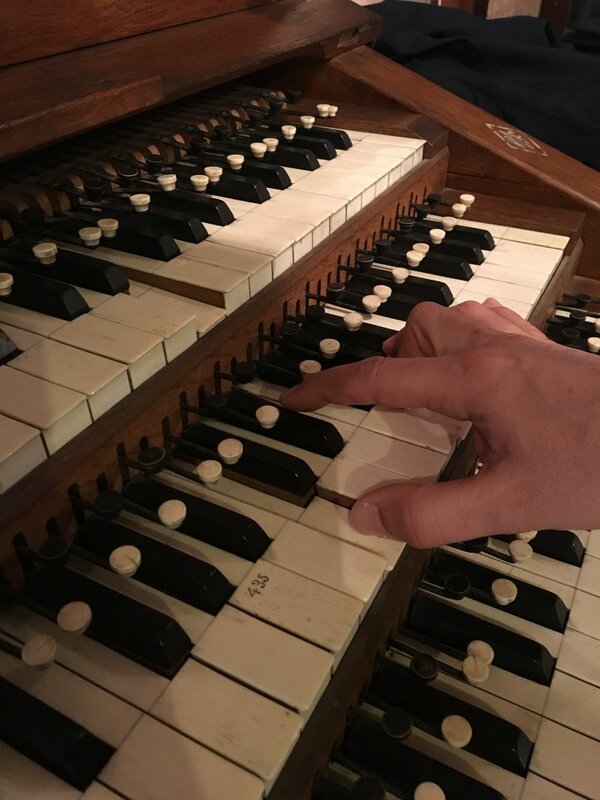 Yet it was in fact anything but natural in practice: it required fifty-three microtonal divisions of the octave instead of the customary twelve, necessitating the construction of keyboards with dozens of additional keys whose intricacies befuddled instrument builders and musicians. The challenges of adapting performance techniques and cultivating new aural skills were taken on by just-intonation societies, eventually boasting hundreds of thousands of members worldwide. 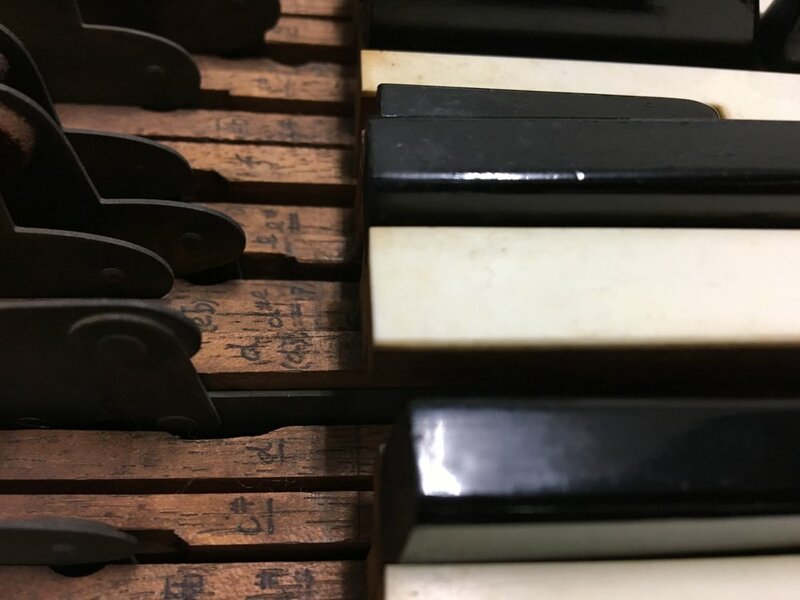 Though ultimately unsuccessful in definitively transforming musical practice, they left a crucial mark on the development of music theory and practice and transcultural exchange. I have so far located dozens of just-intonation keyboards built in the nineteenth-century on three different continents. By 1899, an intrepid musician could have practiced just keyboards in London, Berlin, Rome, Vienna, Boston, St. Petersburg, Tokyo, Poona, Tartu, and Eugene, Oregon. Many of these instruments are now lost, but a few remain. 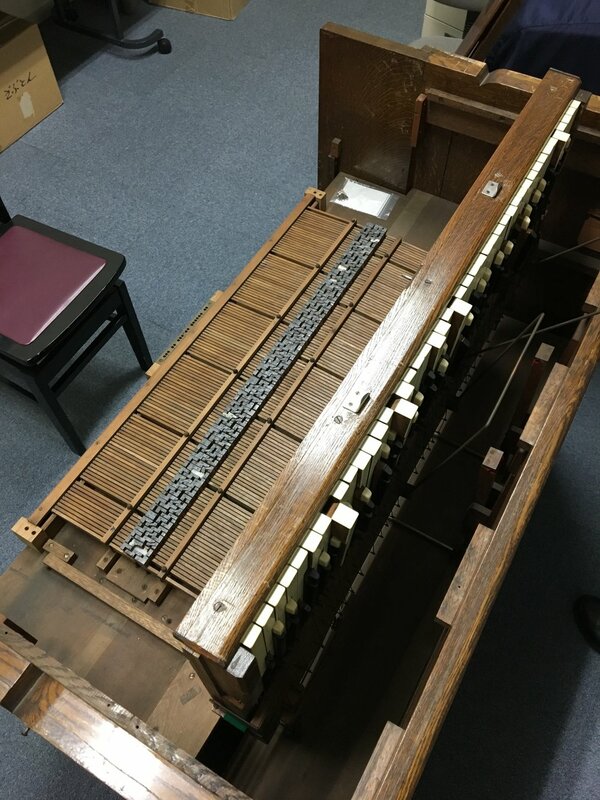 Since 2016, and with generous support from the Leonore Annenberg Fellowship Fund for The Performing and Visual Arts, Reischauer Institute of Japanese Studies, and America-Japan Society, I have focused on learning how to play the just-intonation instruments of Tanaka Shōhei [田中正平: 1862-1945]. Tanaka was the first Japanese overseas student to pursue Western music and acoustics, pursuing a dissertation under the guidance of Hermann Helmholtz, Guido Adler, Phillip Spitta, and Ludwig Bussler. He was only twenty-six when he invented his instrument, a remarkably complicated mechanism featuring twenty-two divisions of the octave, knee levers, and a transposing mechanism. He traveled widely across Europe promoting its virtues, eventually attracting support from Emperors Meiji and Wilhelm II, and musicians including Anton Bruckner, Hans von Bülow, Heinrich von Herzogenberg, Joseph Joachim, Moritz Moszkowski, Carl Reinekce, among others. I have traveled to Germany and Japan to visit the instruments he built that still survive and can be restored to playing condition. 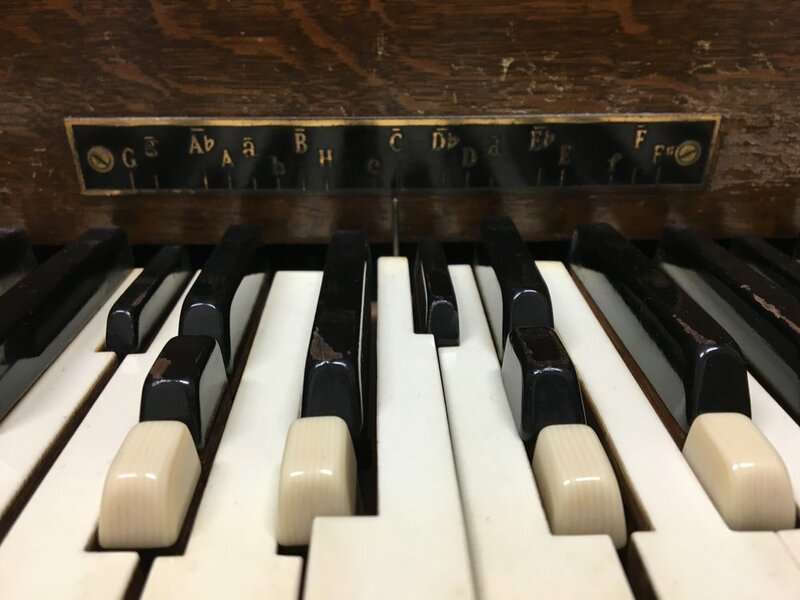 I work with colleagues in a wide range of fields — archivists, museum curators, private collectors, instrument builders, musicians — in the interest of bringing his instruments back to life through concerts, lecture-recitals, and recordings. I do so because hearing once again the harmonies they produce, and feeling the touch of their keyboards in the fingers, can tell us vital information about how nineteenth-century listeners conceived of musical culture, nature, and history. Restoring them in the same spirit as their inventor, who sought to eradicate musical borders by convincing everyone to abandon tradition and join a single universal tuning system, would be misguided. But by granting us the ability to experience for ourselves the sounds that once held great appeal to musical reformists, we can begin to dissolve any temporal boundaries that might prevent us from understanding why Tanaka and his colleagues believed that these instruments were potent tools for the promotion of transnational exchange and political reform. This page features excerpts from my experiences figuring out how they were constructed, and navigating the tricky geometries of their keyboards. I will continue to add photos and videos as the project continues, including full video with bilingual subtitles of my October 2018 lecture-recital and workshop at Kunitachi College of Music in Tokyo. So please return soon! Meanwhile, you can also read my introduction to the musical, social, and political context of Tanaka’s instruments and others similar to it by Thomas Perronet Thompson in “Emancipate the Quartertone: The Call to Revolution in Nineteenth-Century Music Theory,” published in History of Humanities 2:2 (Winter 2017): 327-44. 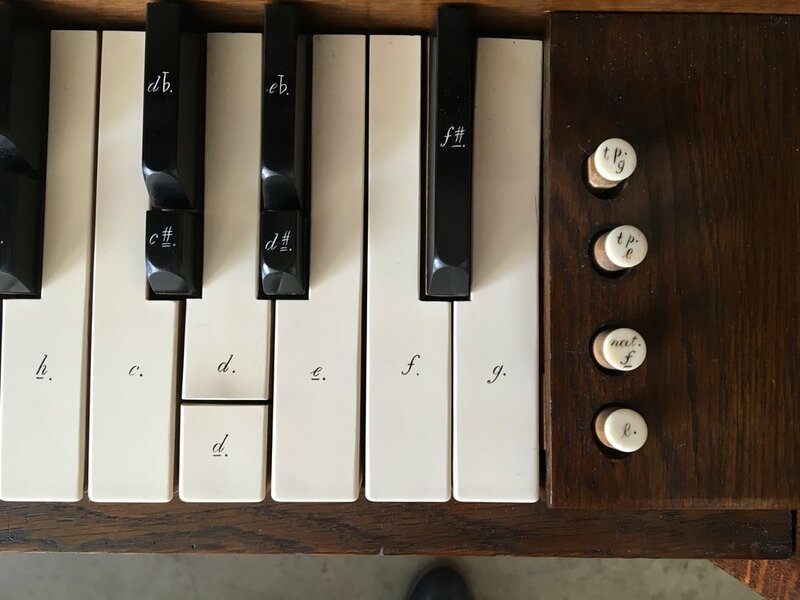 Tanaka designed the Demonstrations-Harmonium as a pedagogical tool to teach pupils how to recognize the intervals of just-intonation and distinguish them as superior from their tempered equivalents. 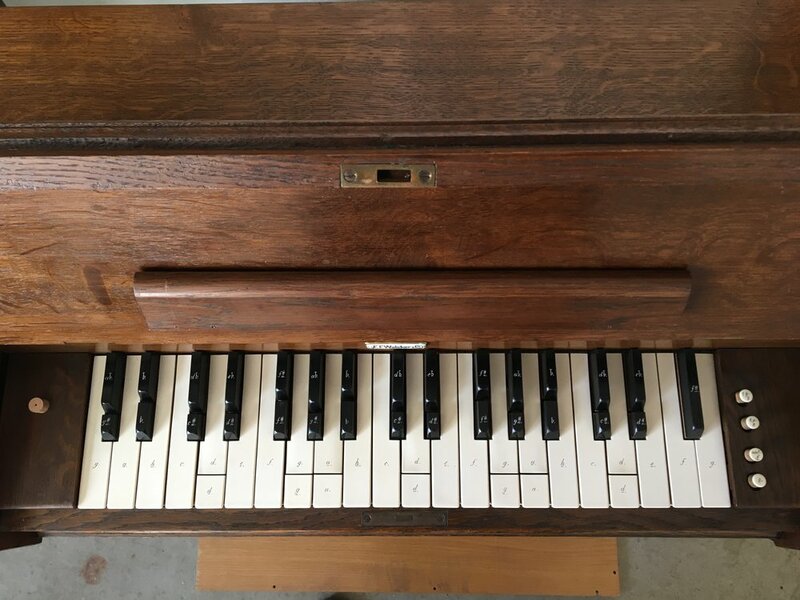 He worked hard to make the instrument as simple as possible, adapting his enharmonium design (see below) by rearranging its layout, dispensing with the knee levers, and reducing the number of keys from twenty-two to twenty. Written correspondence between Tanaka and Walcker documents the importance for him of producing as inexpensive an instrument as possible — only 125-150 M, far less than the 2000 M of his enharmonium — so that every piano teacher in Europe could afford one. Things did not go quite as planned; in the event, he sold no more than six. 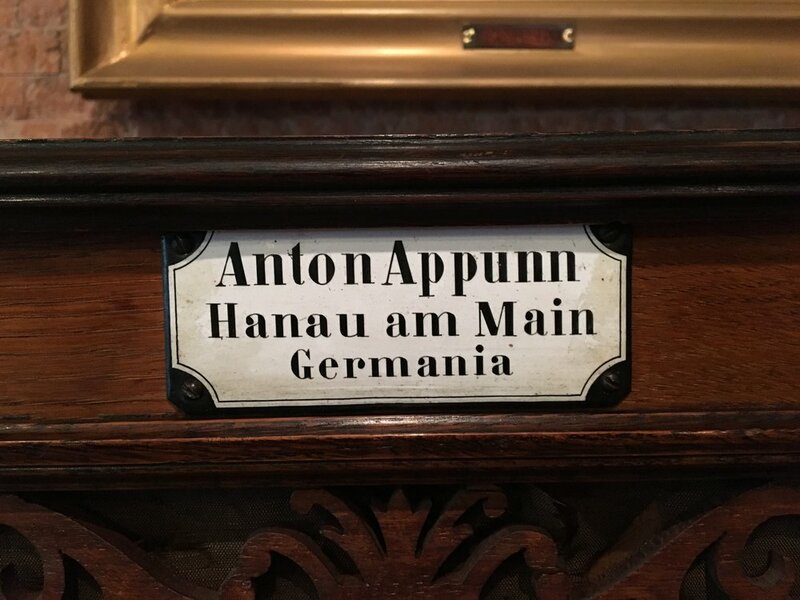 His method is outlined step-by-step in a three page announcement of the instrument circulated to conservatories around Germany: the Aufruf zur Subscription auf ein kleines Demonstrations-Harmonium in reiner (Natur-)Stimmung, from May 1893. I recreated his brief curriculum, adding my own commentary, for a presentation at the 2017 Studio31 Symposium at Schola Cantorum Basiliensis; the following images and videos are taken from that event. I used an instrument owned by Dr. Tanaka Tasuku, Tanaka Shōhei’s grandson, which came into his possession five years ago from an unknown seller. It has since been beautifully restored by Gerhard Walcker-Meyer, grandson of the original builder, and re-tuned with great care by Ulrich Averesch. 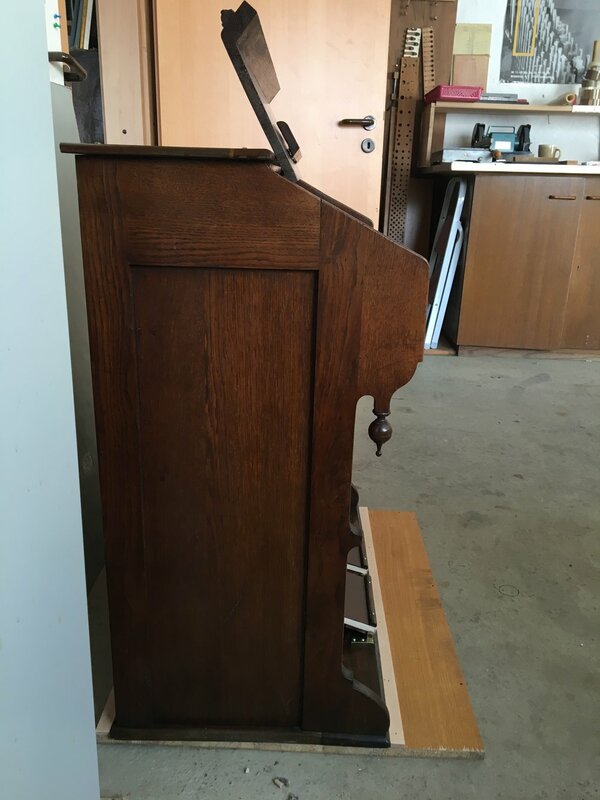 Only one other instrument seems to have survived, and is currently housed at the Oscar-Walcker-Schule in Ludwigsburg. 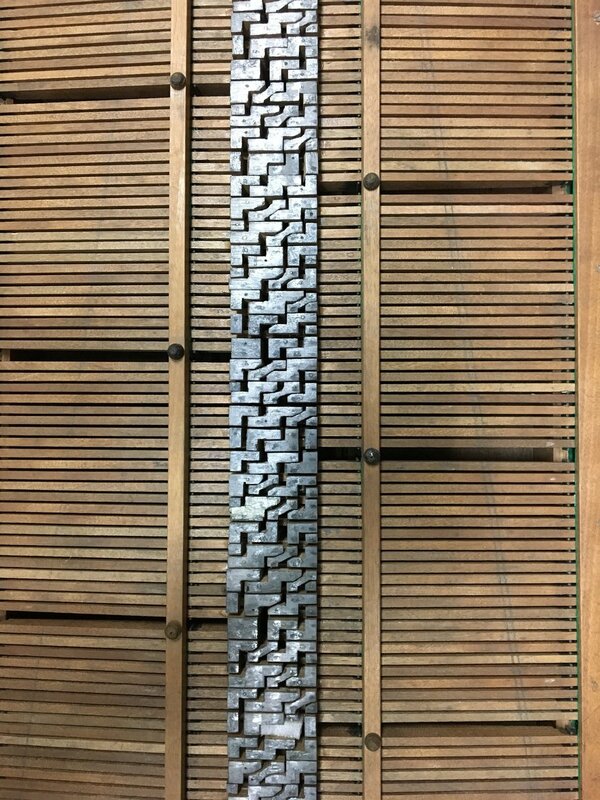 The following images and videos were taken in November 2017 during the Studio31 event and the weeks I spent in Saarbrücken practicing the instrument at the Walcker Orgelbau workshop. Many thanks to Mrs. Kumiko Tanaka for sharing them! Triads built from just, tempered, and Pythagorean intervals on Tanaka’s instrument. Septimal harmonies (i.e. just sevenths) on Tanaka’s instrument. Triads built on the two D-keys on Tanaka’s Harmonium. G# vs. Ab on Tanaka’s instrument. 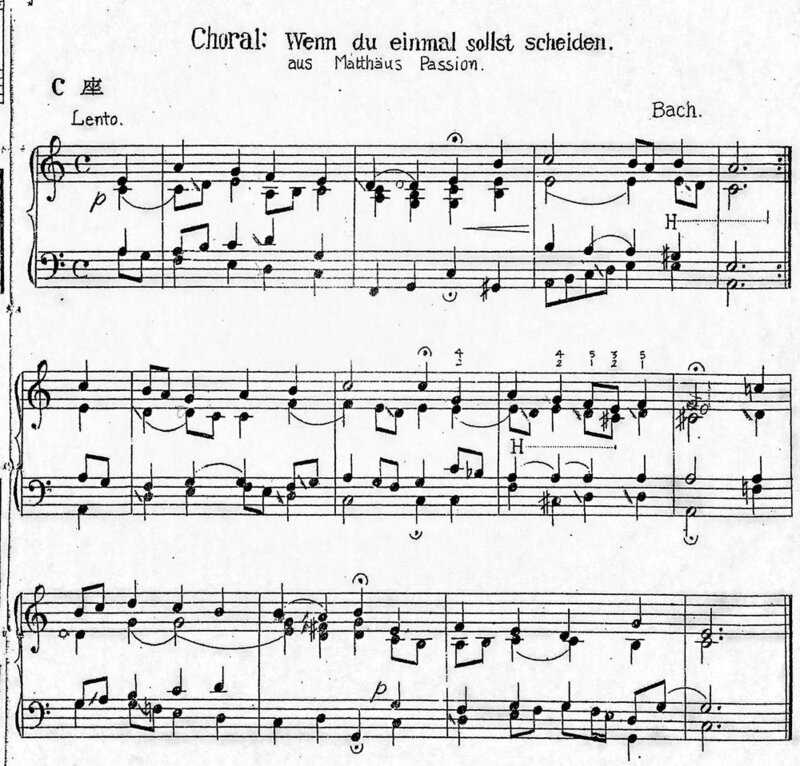 Gustav A. Papendick’s Für meine Kleine, written in 1890 for demonstration on Tanaka’s enharmonium and published the following year in the Sammlung kleiner Vortragsstücke für das Tanaka’sche reingestimmte Harmonium (Breitkopf und Härtel, 1891). It is, to the best of my knowledge, the only work composed specifically for the instrument. Ulrich Averesch shows us inside the instrument of Tanaka’s instrument. 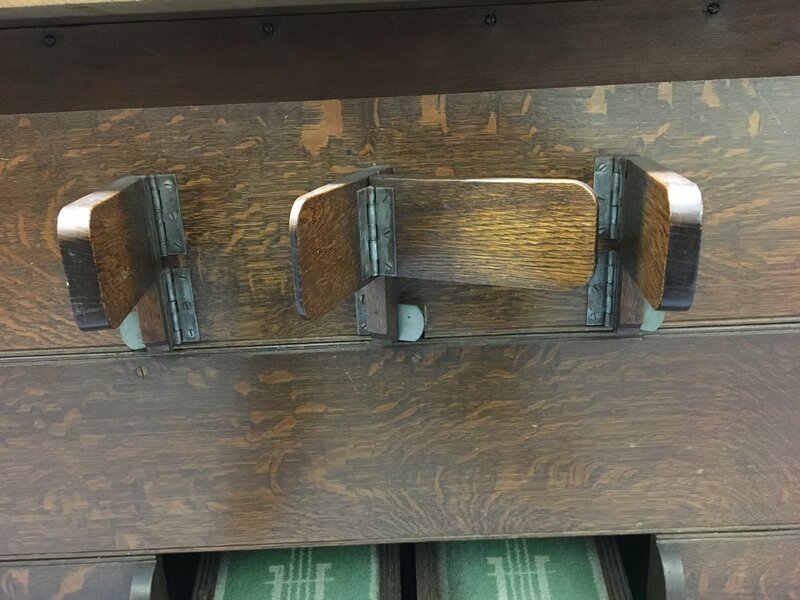 Underneath the keyboard folded out, you can see the row of harmonium reeds; the apertures beneath where the keyboard allow the passage of wind from the foot-powered bellows. 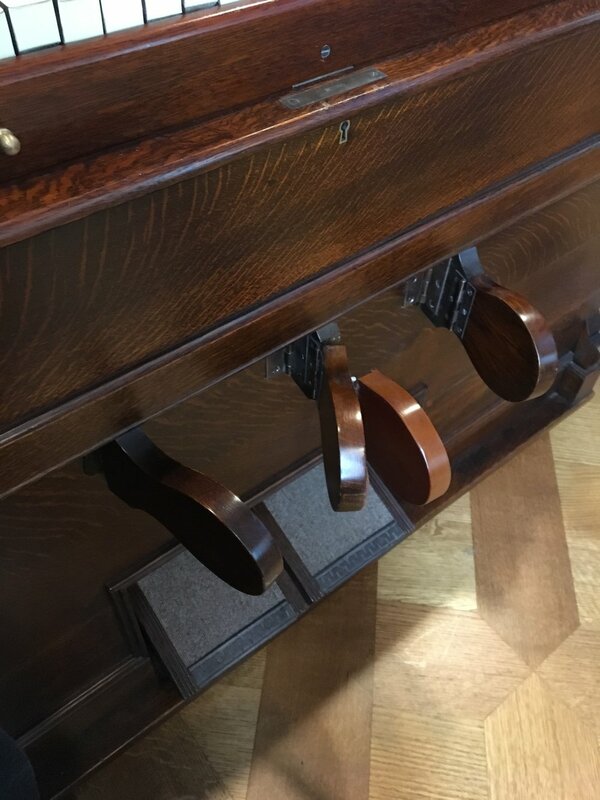 Tanaka built at least five enharmoniums and three “syntonic organs” with three different German makers: Johannes Kewitsch, Philip Trayser, Oscar Walcker. Each of these instruments followed an original blueprint, updated in keeping with his ever-changing theories of just intonation. All eight have been lost or destroyed since World War II. Fortunately, Tanaka began building enharmoniums again thirty years after his return to Japan, and many of these instruments survive. I made two trips to Japan, one in September 2017 and another in October 2018, to take photographs and record my performances on the instruments still in playing condition. I also met with Dr. Tanaka Tasuku, grandson of the inventor, who kindly shared with me his personal archive of letters, photographs, drafts, and calculations that Tanaka Shōhei left behind. This instrument, originally purchased by the Japanese Broadcast Corporation (NHK: Nippon Hoso Kyokai), is now housed at the Collection of Organology at Kunitachi College of Music. 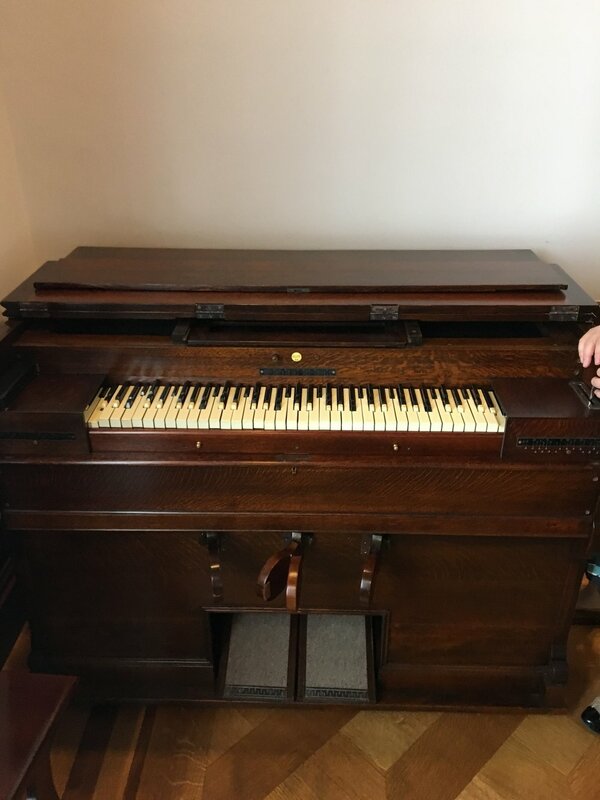 It was recently restored and is in good playing condition, and although it has not been tuned for over a decade it is still suitable for performance. I was grateful that Dr. Yokoi Masako agreed to let me use it for the first time in over fifty years, as part of a workshop and lecture-demonstration held on September 29, 2018. Video from that event is forthcoming. Below is a video of my performance of Bach’s Wenn du einmal sollst scheiden from St. Matthew’s Passion. Tanaka often presented this work in his demonstrations since it does a good job of illustrating the use of syntonic commas (the distinction between a third tuned in perfect fifths and a just major third) and other narrow enharmonic intervals. At left is an image of his arrangement of the piece for enharmonium. I found it difficult to play at first, but in less than an hour (I had only two hours with the instrument, in total!) I was able to play it through without error — confirming, perhaps, Tanaka’s claims that the instrument is not necessarily as difficult to learn as it looks. You can see my hands navigating the diatonic and enharmonic keys. Each \ strike on the score indicates a pitch lowered a syntonic comma; each / indicates one raised by a syntonic comma. The Chorale “Wenn du einmal sollst scheiden” from Bach’s St. Matthew’s Passion. This was a favorite excerpt of Tanaka’s to present in demonstration. Presenting Tanaka’s enharmonium at the workshop and lecture-recital with Dr. Tanaka Tasuku at Kunitachi College of Music on September 29, 2018. This instrument was originally built for Baron Ōkura Kishichiro [大倉 喜七郎], a Cambridge-educated heir to the famous Õkura Hotel chain. Ōkura was passionate about music and was himself the inventor of a musical instrument: the okraulo, a metal hybrid of a traditional shakuhachi and modern flute. It is no longer playable, but Dr. Shima was gracious enough to allow me a look under the hood to examine the intricate mechanism of the instrument. Images 3-7 provide details of the keyboard; in the last image, you can see what appears to be Tanaka’s own handwriting naming each key. Image 8 shows the knee levers that operate the instrument: the lever on the left changes selected sharps into harmonic sevenths, the center lever shifts the back row of sharps down two syntonic commas (e.g. from G# to Ab), and the right lever is a dynamic swell. Images 9-11 show the complex system of interlocking metal bars that triggers the openings to the air passage from the bellows, regulating which tone sounds when. (It is the “fingerprint” to the instrument; each enharmonium he designed had a distinctive pattern.) Image 12 shows the row of harmonium reeds. Image 13 is the nameplate. Image 14 is a card detailing when the instrument was tuned (last recorded date is 1938…). The final image is of Dr. Shima and myself following my visit to Hamamatsu. 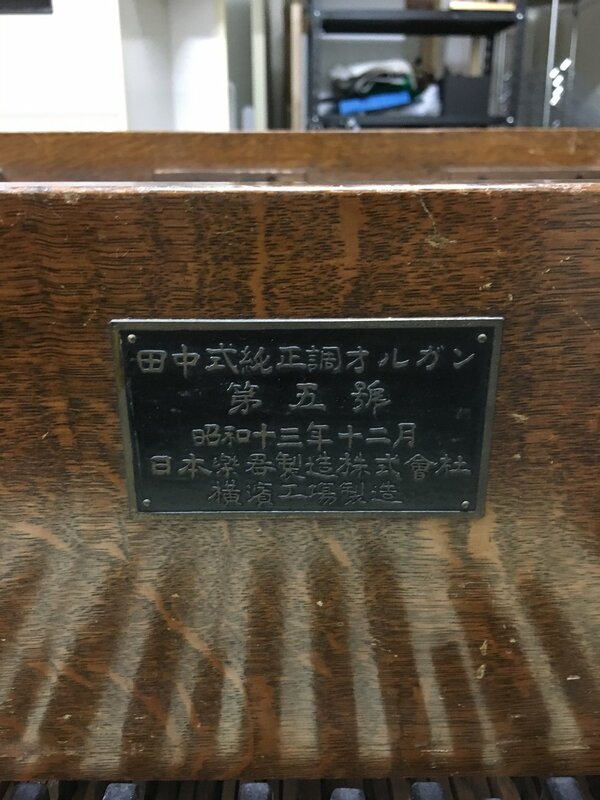 Dr. Shima lifts up the keyboard to Tanaka’s enharmonium to show us the “fingerprint” of the internal mechanism regulating the passage of air from the bellows to the reeds. This instrument was built for Duke Matsudaira Tsuneo [松平 恒雄], foreign diplomat and Head of the Imperial Household Agency. It was later donated to the Buddhist Music Association and later ended up in the hands of Kyoto Women’s University. 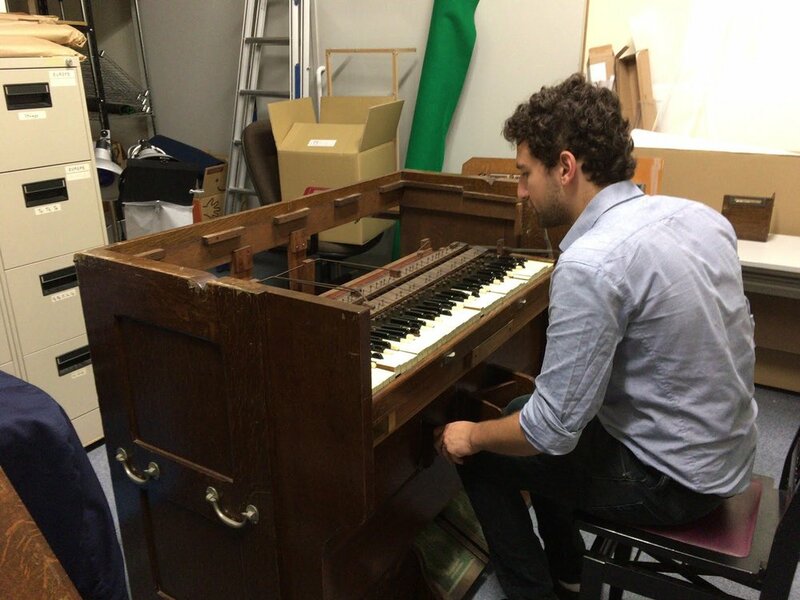 The instrument was fully restored and retuned within the last decade. It has not been played since because the school lacks funds for maintenance, so I was unable to play anything more than a single just triad on the instrument. It is nevertheless in excellent condition. Images 1-4 provide details of the instrument, keyboard, and knee levers (for a description see above). Image 5 shows the pegs on the side that mark which transposition the instrument is in. Arakawa-sensei demonstrates the just triad on the enharmonium at Kyoto Women’s University. Arakawa-sensei demonstrates two types of sevenths on Tanaka’s enharmonium. The first is made from three just thirds; the second replaces the seventh of that chord with a “harmonic seventh” at a 4:7 ratio. Pietro Blaserna, one of the most important Italian physicists of the nineteenth-century, commissioned a just-intonation harmonium from a German builder only three years before Tanaka’s. 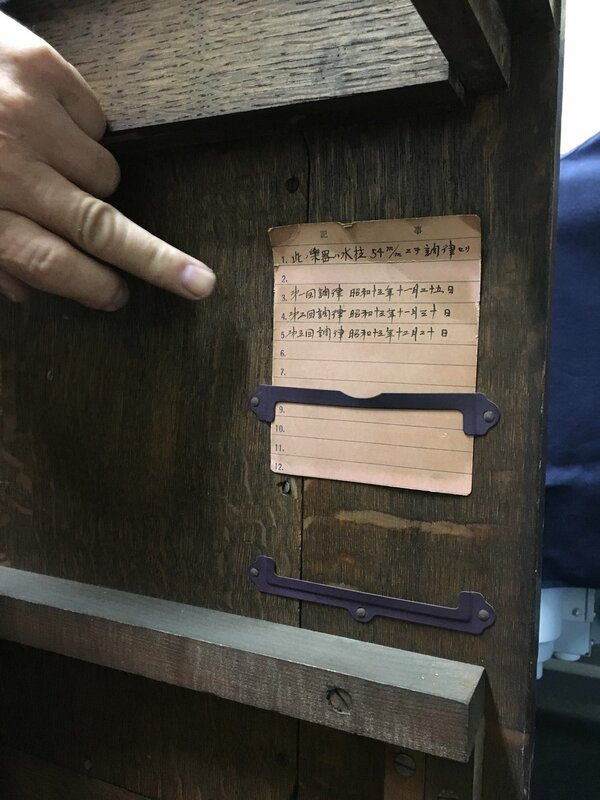 He did not intend the instrument for musical performance: his idea was to use it for acoustical experiments and other scientific investigations into “exact tuning.” It was afterwards donated to Università La Sapienza in Rome, where it has been carefully restored to playing condition last year. It has never been retuned, but only a few intervals show any sign of wear and tear. The disposition of the keys is quite different from Tanaka’s, and much more simple. 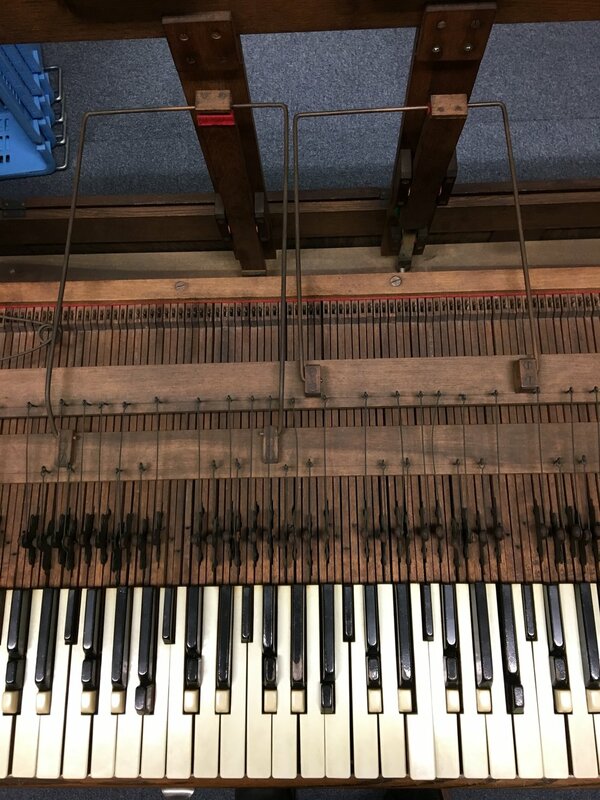 The bottom twelve keys of each manual are tuned in perfect fifths, and the buttons above are tuned in just thirds from the keys below. The row of buttons on each manual is equivalent to the row of keys on the manual above it. This makes it quite easy for harmonic demonstrations, but rather tricky for performance. The sound is remarkably powerful, since the bellows are quite a bit larger on his instrument than they are on Tanaka’s, and the beating patterns for each interval are extraordinarily clear. I was astonished to find that the whole room vibrated at times; you can see the patterns of these vibrations, unique for each interval, clearly on the screen of my digital camera that I had placed on a table just to the side of the keyboard. Three triads (Pythagorean, then just) on the three ranks of Blaserna’s harmonium. You can hear clearly how each rank is lower a syntonic comma moving upwards, as the just third becomes the basis for the next keyboard above it. Demonstrating Blaserna’s chord progression for circulating smoothly between ranks of the keyboard: C, C7, F6/4 - F, F7, Bb6/4 - Bb, Bb7, Eb6/4. 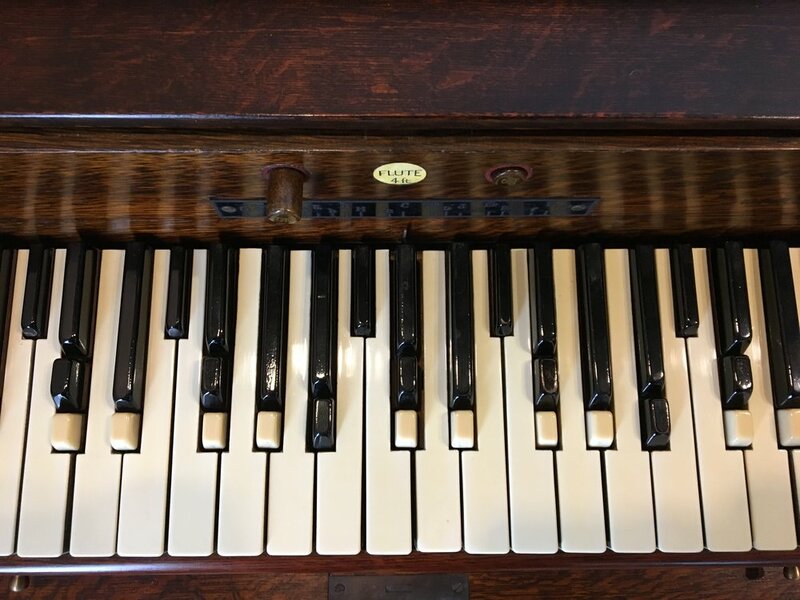 The camera vibrates in different patterns due to the powerful oscillations from the harmonium. You can see how each intervallic relation produces a different vibrating pattern on the screen. My sincerest thanks and gratitude goes to Dr. Tanaka Tasuku and his wife Kumiko Tasuku, for generously allowing me to perform on these beautiful instruments invented by Dr. Tanaka’s grandfather; Gerhard Walcker-Meyer and Ulrich Averesch for restoring the Demonstrations-Harmonium to its former glory (more on their work here); Dr. Giovanni Organtini, for introducing me to Blaserna’s harmonium at the Museo di Fisica at Università La Sapienza, and having it restored before my second visit; Profs. Martin Kirnbauer, Caspar Johannes Walter, and Johannes Keller for inviting me to bring Tanaka’s instrument to Basel, and present a lecture-recital as part of the 2017 Studio31 Symposium focused on the revival of sixteenth-century enharmonic keyboards; to Masako Yokoi-sensei and Nakamizo Kazue-sensei of the Kunitachi College of Music Collection for Organology, for their help in arranging the October 2018 lecture-recital and workshop featuring the enharmonium in their collection; Arakawa Keiko-sensei, for demonstrating the instrument at Kyoto Women’s University; Shima Kazuhiko-sensei, Director of the Hamamatsu Museum of Musical Instruments, for allowing me to take apart the instrument in his collection and photograph the remarkable geometries of its interior design.